* The number of free mobile device licenses given equals the number of protected objects covered by a license. ** Decryption is available free of charge provided these requirements are met. A notice for users who plan to purchase a license for Dr.Web Anti-virus for Windows. This product is not enough to protect PCs from encryption ransomware. Before you make a final purchase decision, please review the с terms of our free data recovery service. You don't need to purchase Dr.Web KATANA. 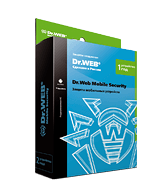 Its protection technologies are incorporated into the Dr.Web applications you are already using.